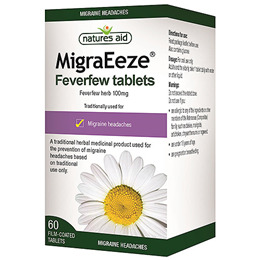 Natures Aid MigraEeze Feverfew tablets are a traditional herbal medicinal product used for the prevention of migraine headaches. Feverfew, sometimes referred to as the “big chamomile”, is a member of the Daisy family and is also known as Tanacetum parthenium or Chrysanthemum parthenium. The plant itself was valued by the Ancient Egyptians and Greeks. A migraine is usually characterized by a severe, throbbing headache at the front or side of the head. The frequency of migraines from those that experience them varies from several times per week to those that may only experience one or two a year. People suffering from migraines may also suffer from other symptoms such as nausea, vomiting and increased sensitivity to light or sound. There are approximately eight million people in the UK who suffer from migraines with 190,000 attacks every day. The condition affects nearly three times as many women as men. Feverfew herb (Tanacetum parthenium [L.] Schulz Bip.). Adults and the elderly, take 1 tablet daily with water or other liquid. Before using this product, you must have been told by your doctor that you have migraine headaches. Do not use if you are allergic to any of the ingredients or other members of the Asteraceae (Compositae) family, such as daisies, marigolds, artichokes, chrysanthemums or ragweed. Do not use if you are under 18 years of age. 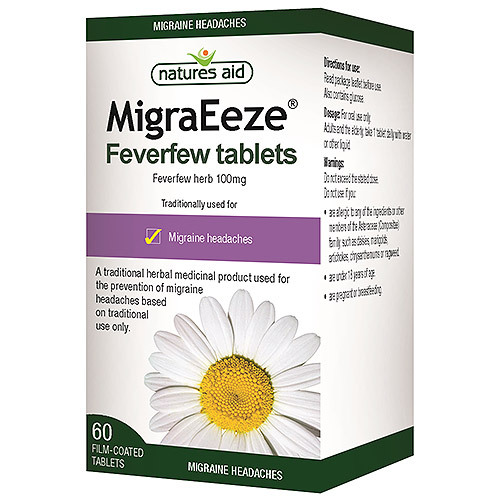 Below are reviews of Natures Aid MigraEeze - Feverfew - 60 Tablets by bodykind customers. If you have tried this product we'd love to hear what you think so please leave a review.